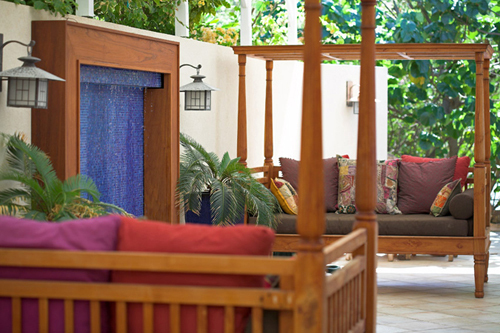 A whimsical feel is created by Indonesian daybeds, that rest under a covered pergola, for an open and airy feel. The Asian inspired sconces, exotic plants, and cultural furniture add layers of interest to the villa. A place to relax with a book or enjoy an afternoon nap listening to the waterfall.